When securing outside equity investment, you should consider all aspects of the proposed deal before making a final decision. The amount of funding is clearly one of the most important considerations for any financing arrangement, but you should analyze the other terms of the deal, as well. If you focus only on the financing amount (or the valuation), you may enter a restrictive deal with long-lasting consequences. 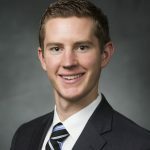 This article explains how dilution can significantly change your ownership position as the startup issues additional equity via funding rounds or stock option programs. Dilution is the decrease in a shareholder’s ownership percentage as the company secures additional equity funding. Whenever a company raises equity financing, investors contributing the capital receive shares of stock, which represent partial ownership in the company. In aggregate, the outstanding1 shares represent complete (100%) ownership of the company. By issuing additional shares to new investors, the prior shareholders concede some of the company’s ownership to the incoming investors, decreasing the prior shareholders’ ownership percentage. To better understand the concept of dilution, imagine that Investor A owns all 90 shares of a company. Her ownership percentage2 is 100%. Now, imagine that the company raises equity financing by issuing 10 new shares to Investor B. After the financing, Investor A’s ownership percentage drops from 100% to 90% (90 shares/100 shares). The issuance of additional shares to Investor B diluted Investor A’s stake in the company, even though Investor A did not sell any of her stock. Dilution is often a necessary tradeoff if you want to maximize the value of your startup (and your equity stake). Startups need capital to sustain their growth and invest in initiatives that will ultimately generate shareholder value. Founders often begrudgingly accept dilution in hopes that the funding will lead to a large increase in the company valuation. A founder who controls 100% of a $1 million company is worse off financially than a founder who owns 10% of a $100 million company. In addition to maximizing value, some founders accept significant amounts of dilution out of necessity. A struggling, cash-strapped startup may have no other way to raise funding. Other founders willingly accept some dilution because they believe that the experience and expertise that the new investors will provide adds more value than what was lost due to dilution. In different stages of the startup financing process, investors expect different levels of ownership in exchange for their investments. Generally, the later in the company lifecycle that investors take a stake in a company, the smaller percentage of ownership they will receive. A successful company’s valuation generally increases as it matures, meaning that over time, investors must provide additional capital to receive the same percentage of ownership. For example, $200,000 invested as part of a seed round in a company valued at $2 million post-money3 represents a 10% ownership stake. A $200,000 investment in a later funding round that values the company at $20 million post-money only secures a 1% ownership stake. Allocating ownership this way rewards early-stage investors for making high-risk investments in developing companies, while later-stage investors receive lower returns for taking on less risk. Since each startup has its own unique financing situation, the dilution experienced at each stage depends greatly on the decisions of the startup’s founders and investors, as well as the startup’s overall performance. Most investors do not disclose what ownership percentage they acquire in their investments, but a handful of investors have shed some light on the subject. YCombinator, the renowned startup accelerator, typically offers to invest $120,000 for 7% of the early-stage startups that are part of its program. 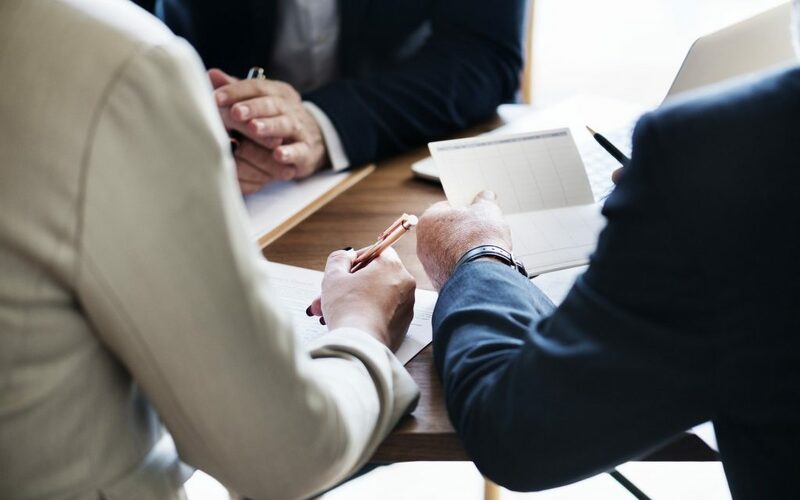 Fred Wilson, an established venture capital investor (or VC), provides some general guidelines for entrepreneurs regarding how much ownership investors seek in the company at each stage of financing. As shown in the table above, Series A investors usually demand the highest percentage in the company. The Series A round often represents a much larger capital investment compared to prior fundraising efforts and a substantially higher risk than later funding rounds. VCs therefore require a higher stake in the company to compensate them for the high risk of the investment. Wilson has also provided some general estimates (shown in the table below) for the typical ownership structure in companies that undergo a late-stage exit, like an IPO. While these estimates can be useful, remember that each company may have a different ownership structure depending on its financing choices. For example, if a company has an early-stage exit, the founders would probably have a significantly higher ownership than what Wilson suggests while investors would have a lower ownership percentage. 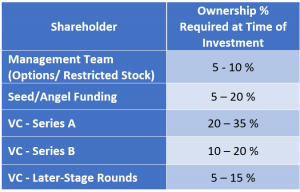 Although founders often expect to retain control over their startup forever, the table above shows that outside investors usually own the majority of shares in a late-stage startup. Founders lose much of their ownership because they are diluted with each round of financing. Founders should remember during early-stage funding that additional dilution will likely occur in the future. Special provisions within investor agreements also contribute to the dilution of founder’s equity positions. Many agreements include anti-dilution provisions which prevent an investor’s stakes from being diluted in the event of a down round4. Investors also receive pro-rata rights which allow them to participate in subsequent financing rounds to maintain their ownership percentages. Without these additional protections, founders often experience higher levels of dilution than investors. Since each equity financing round changes the ownership structure of the startup company, startups must track changes in each investor’s equity stake in a systematic way. Most startups use computer spreadsheets or software programs to construct capitalization tables, which record the ownership percentage of each investor. In addition to shares controlled by founders and investors, the firm also records issuances of securities which may become stock in the future such as restricted stock units, warrants, and stock options. 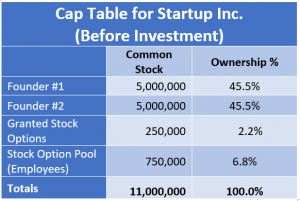 Cap tables are important tools for founders, current investors, and future investors to fully comprehend their current ownership position in the company and how different funding scenarios might impact their ownership. Throughout the rest of this article, you will see cap tables used for illustrative purposes. Now imagine that Startup Inc. successfully completes a Series A round with two investors providing all the capital for the funding round. Investor #1 purchases 3 million shares and Investor #2 purchases 2 million shares. Observe how the ownership percentages changed following the Series A funding round. Given the capital structure after Series A funding, each founder only owns 31.25% of the overall company. Each founder would still have 45.5% ownership if Startup Inc. had not raised the Series A funding. Although the founders jointly own over 50% of Startup Inc., they will experience more dilution with each additional equity round (Series B, Series C, etc.). Startups often attract new talent by establishing employee stock option programs, which allow employees to benefit from the startup’s potential upside and limit the startup’s cash compensation expenses. 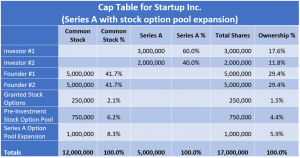 Understanding how valuable these programs can be to a startup’s long-term success, incoming investors require startups to set up stock option pools—shares of stock reserved for employee stock options. Management and investors usually discuss the size of the option pool as part of their negotiations prior to finalizing a deal. Decisions regarding the number of stock options to grant, when the options vest, and when the stock option pool will be formed have a significant impact on a startup’s capital structure. The timing of when the startup creates the option pool determines which shareholders experience dilution. If the startup expands the stock option pool before the new funding round, only the past shareholders (including founders) will be diluted. If the startup expands the stock option pool after the new funding round, then all shareholders (including the new investors) will be diluted. Since incoming investors typically have better negotiating leverage and they want to ensure that the pool will be expanded before committing their investment, startups usually must expand the stock option pool before closing the new funding round. Depending on the details of the stock option plan, the stock option pool can cause significant dilution to founders. However, founders who are unwilling to provide adequate employee stock option packages may struggle to attract talented employees, harming the startup’s development. Formulating a comprehensive stock-based compensation strategy is beyond the scope of this article, but the topic deserves the attention of founders, investors, and management. To better illustrate how the option pool affects company ownership, we will reconsider the Series A funding round for Startup Inc. 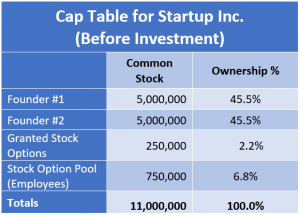 The cap table below shows the initial ownership structure for Startup Inc. before the Series A investment. Now imagine that Startup Inc. wants to raise Series A funding from a different set of investors. The new investors want Startup Inc. to expand its stock option pool by 1 million shares before agreeing to a deal. This expansion dilutes the founder’s overall ownership by around 4% each before accounting for the new investors’ upcoming investment in the company, as seen in the cap table below. When the new investing group completes its investment, the existing shareholders are diluted even further. By structuring the stock option pool expansion to occur before their investment, the new investors can secure a higher ownership percentage than if the stock option pool occurred after the Series A round. 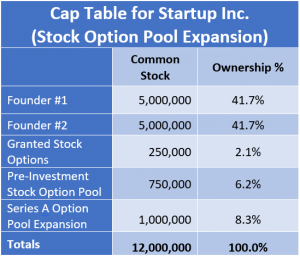 Startup Inc.’s cap table following both the stock option pool expansion and the Series A investment (under the same terms as the agreement discussed in the dilution section) is shown below. After raising the Series A financing and expanding the option pool, each founder only owns 29.4% of Startup Inc, compared to 31.2% ownership after raising Series A without expanding the option pool. Stock pool expansions in future funding rounds would follow a similar pattern. If Startup Inc. were to raise Series B funding from a new set of investors and needed to expand its option pool before the investment, the option pool expansion would dilute investor #1 and #2, founder #1 and #2, and any previously-issued stock options. Meanwhile, the Series B investors would not be diluted by the option pool expansion. As your startup grows, issues relating to dilution and stock option pools can each have a profound effect on the future of your company. A thorough understanding of these topics will help you to make wiser fundraising decisions as you analyze the terms of the deal, not only the size of the funding round or the valuation. By avoiding major pitfalls in these areas, you will maintain better control over your startup’s future and hopefully come closer to achieving your goals. Fred Wilson Blog: Founder Dilution – How Much is Normal? Outstanding Shares – The number of shares the company has issued. Ownership Percentage – Calculated by using the following formula: # of shares / # of shares outstanding. Post-money – Valuations that include the additional capital provided by the new investor. Down Round – An equity round where the startup’s valuation decreases from the previous round. In a down round, shareholders experience much more dilution than in an up round. Bootstrapping – Refers to the practice of using personal funds or internally generated cash flows to finance the business in lieu of raising capital from investors.